Picture yourself sitting poolside, the sun is hot and you’re sipping an ice cold refreshing drink to keep you cool. 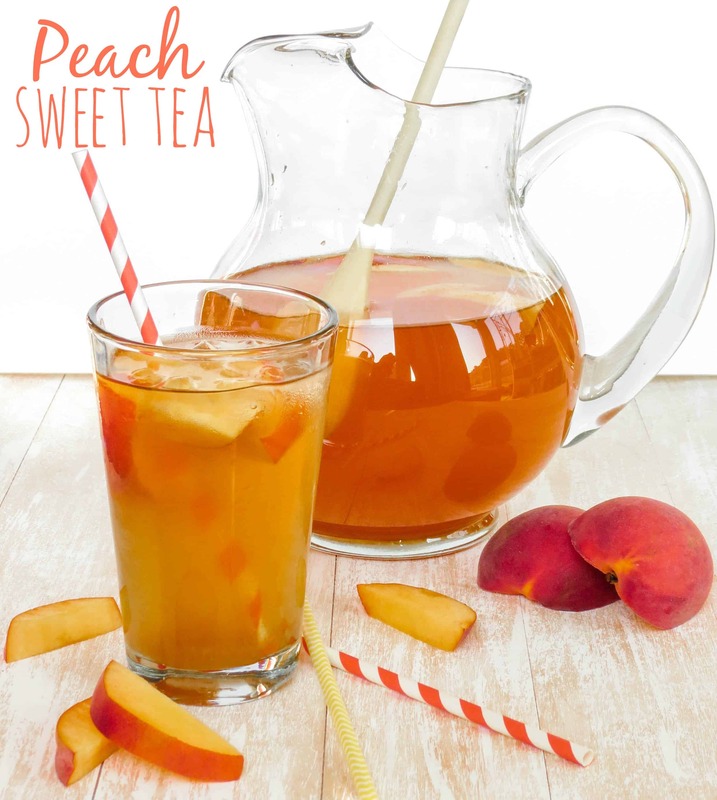 Well, that drink my friends, would be this amazing Peach Sweet Tea! 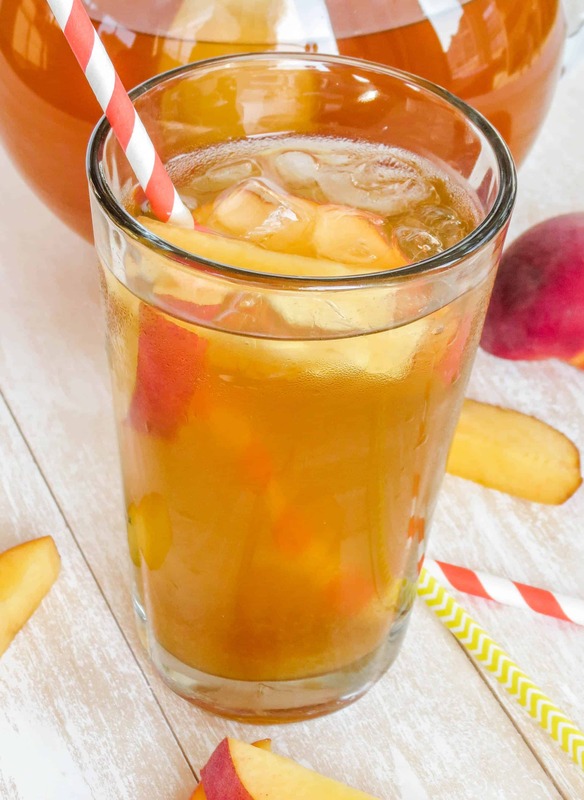 I can’t even believe it took me this long to make this at home because I am in LOVE with Dunkin Donuts’ peach sweet tea and this version is even better because it’s homemade! Isn’t everything better homemade? I’ve already made this 5 times in the past 2 weeks because my family can’t get enough of it! It’s so perfect for large gatherings because of how simple it is to make. You can double or even triple the recipe for however many people you are serving! The tea is flavored with a peach simple syrup. You honestly can do this with any fruit that you’d like! I just really, really love peaches and peach sweet tea. The syrup is like sweet, candied liquid peaches. I have made it both with white and yellow peaches and I thought the batch made with the yellow peaches was much better because the flavor is more pronounced and they’re much sweeter than white peaches. They both taste delicious, so if you can’t get ahold of yellow peaches, don’t fret! Oh, and did I mention how ridiculously easy this is to make?! 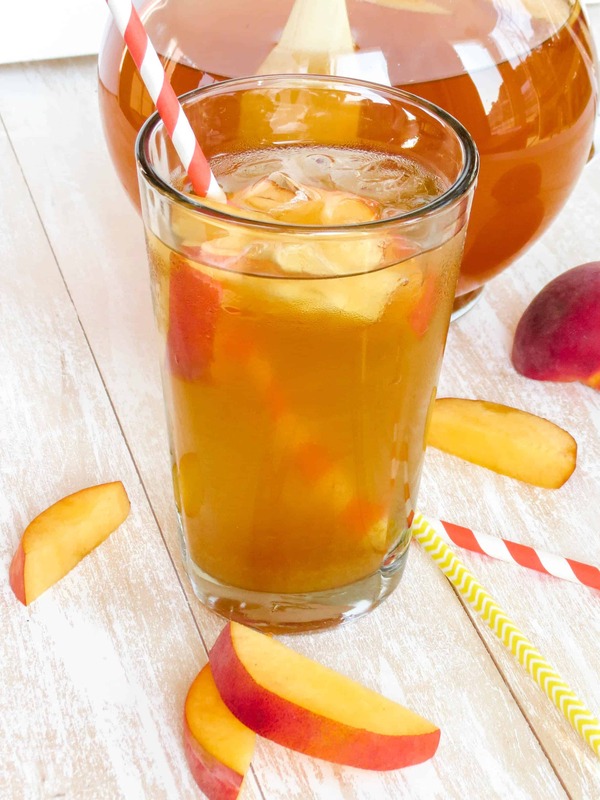 You just steep a few tea bags in a big pot of water, make the simple syrup with peaches, let it steep for a little while, strain and mix them together! That’s it and you’ve got a delicious drink, perfect for these hot summer days (while they last)! Alternately, you can leave the syrup and tea separate and you can put as much or as little syrup as you’d like to control the sweetness for each serving. Served over ice (preferrably with some cute straws ), this drink is sure to be enjoyed by everyone! In a large pot, heat water (for tea) until very hot. Steep tea bags for no longer than 5 minutes (or else they may make your tea taste bitter). Pour mixture into a large pitcher and chill tea in refrigerator until completely cooled. For peach syrup, heat water and sugar in a small saucepan and whisk until sugar is completely dissolved. Add peaches and let them soften for about 5 minutes over heat. Mash them a little bit so they release more of their juices. Let them steep over heat for another 2 minutes. Remove mixture off of heat and cover. Let it steep for 30 minutes letting it come to room temperature also. If it is still hot after 30 minutes, place mixture in the refrigerator until cool. Add peach syrup to tea and serve over ice. Alternately, you can serve them separate and each person can put as much syrup as they want to control the sweetness. Peach sweet tea would be a different twist compared to green tea. Yes! It’s so light and refreshing.